A moment's peace on the road in Ethiopia. Front fender was removed because mud jammed the wheel. 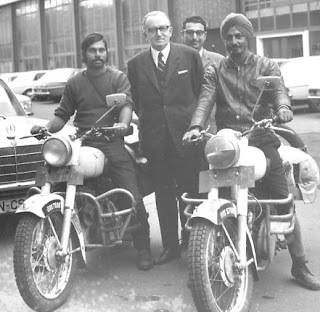 Sampuran Singh, Subhash Sharma, Ashok Kher and Manmohan Singh traveled the world by Royal Enfield in 1971. It was an idea first hatched by Subhash Sharma among friends in the summer of 1969 — a far different time. "Imagine no GPS, no maps, no Internet, no cell phones, no clue about what snow is," notes his account, published in xBhp magazine in 2011. 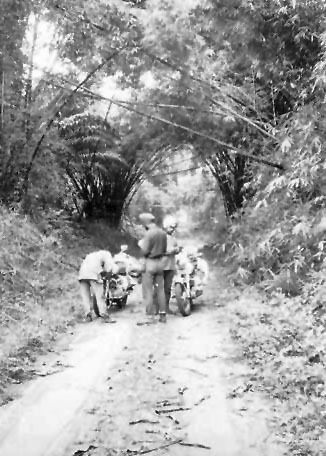 Their ride was also featured in Royal Enfield's The Beat magazine that year, the 40th anniversary of the trip. It's an amazing story, one Subhash recently shared with me. He was only 22 years old in 1969, with little real idea what he was about to attempt. My first question was: if young again, would he do it over? "Yes, if I were young and I had the similar friends with me, I will agree to do such a trip in a heart beat," he replied. "My desire to travel is still very strong and I still take three-to-four international trips every year but in more conventional way." 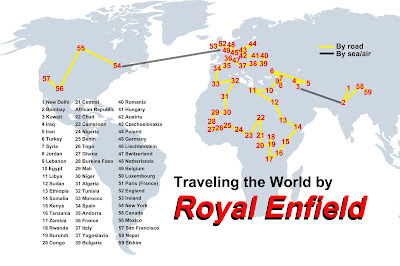 I asked: Why Royal Enfields? "Selecting the Royal Enfield motorcycle for that trip was quite easy," he replied. 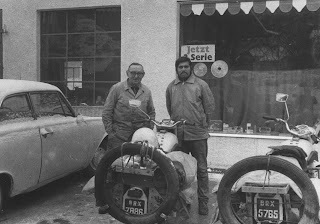 "In late '60s there were only three motorcycles produced in India... For our trip we needed a durable four-stroke motor with some substantial power. So that is why we picked the Royal Enfield." Manmohan Singh already owned a Royal Enfield motorcycle. A second, Army surplus Bullet 350 was purchased at an auction. Subhash Sharma in Nairobi, Kenya. Far from packing for a vacation, planning took 14 months. The trip was officially sanctioned by government authorities and approved and supported in part by their employer, Tata Engineering & Locomotive Co. They departed from the firm's front gate on Jan. 29, 1971 and almost immediately found their route blocked. International tensions denied the four permission to ride through Pakistan. Help came from no less a person than industrialist Sumant Moolgaokar, one of the creators of Tata Motors. The team accompanied a load of Tata-made buses on a ship to Kuwait. From Kuwait they rode through Iraq and Turkey. In Turkey they encountered snow, ice and sleet that froze handlebar controls. They tucked the running motorcycles under tarps and let the heat melt the ice. 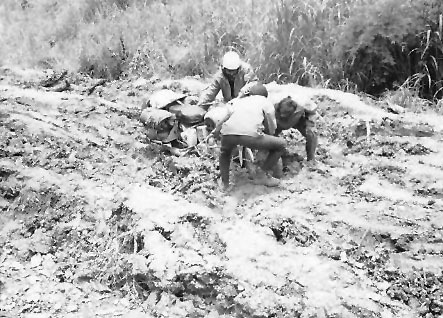 A Royal Enfield almost disappears into mire in Congo. From Lebanon they traveled by ship to Egypt — taking them around Arab-Israeli conflicts — but the Libyan border was closed to non-Arabs and they were denied entry. This meant a detour through Sudan, Ethiopia, Somalia, Kenya, Uganda. In Agadez, Niger the team was delayed waiting for a commercial truck to follow. 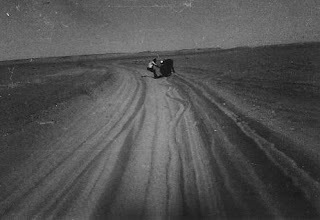 Officials were afraid they would get lost if a sand storm obscured the route. 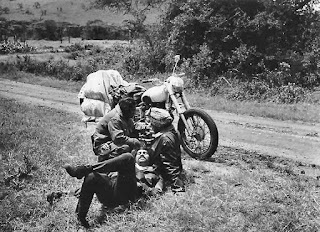 Of Ethiopia, Subhash wrote: "Though riding through the highlands was extremely precarious, we really enjoyed the pleasure of hearing our Royal Enfields' sound echoing through the canyons." In Congo a camera filled with precious photos was stolen and there was a serious breakdown: a stuck valve. A mechanic modified a valve from a Jeep to replace it. On the road in the Central African Republic. The Central African Republic, Chad, Cameroon and Nigeria brought more challenges. Mud was so thick in Nigeria that wheel spokes sheared off when power was applied. Manmohan Singh came down with malaria. While he rested the wheel of an Ariel motorcycle was modified to replace a damaged Royal Enfield wheel. West Africa, then Mali and Saharan sand through which they literally pushed the motorcycles. 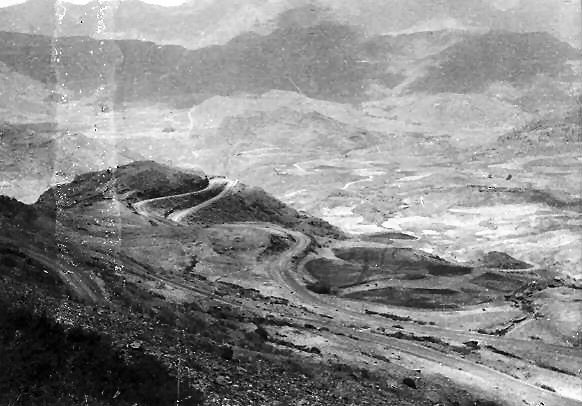 Wavy tracks mark the site of a skid and a fall in the Sahara. A flat tire near a restricted airfield in Algeria brought near arrest by armed soldiers. But they were feted in the capital, Algiers, and told they were the first Indians to cross the central Sahara on Indian-made motorcycles. 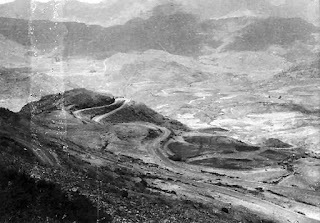 Morocco, then a ferry to Spain, and into Europe. 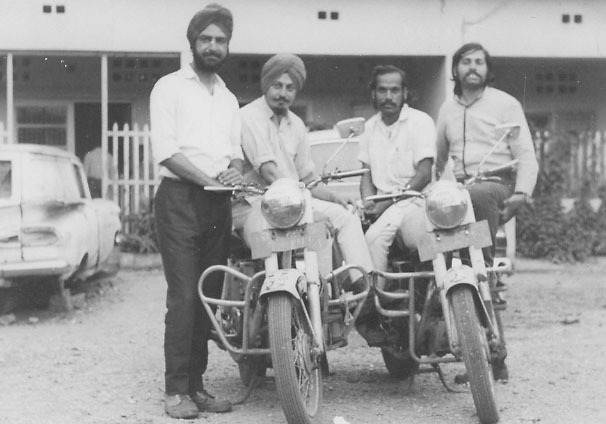 In Italy, after 10 months of traveling, Sampuran Singh and Ashok Kehr decided to return to India — which they would do by hitchhiking, leaving the remaining pair with the two motorcycles. Subhash Sharma in Germany, with a mechanic who fixed one of the bikes, but refused payment. 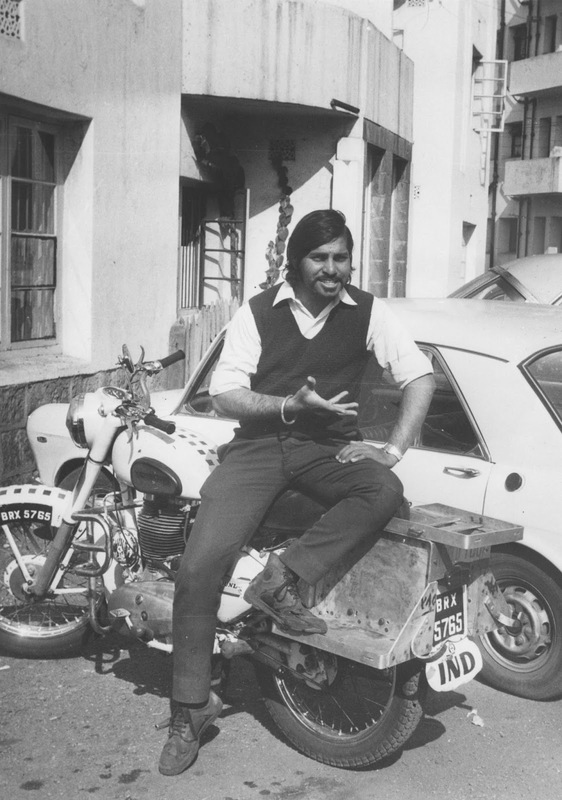 "Up to that point in our travels, we hadn't encountered anyone who was familiar with Royal Enfield motorcycles," Subhash Sharma's story recounts. Arriving, finally, by ferry in England they expected to find a ready supply of parts. But with Royal Enfield out of business in the UK they found they would have to wait for parts to reach them from India. A highlight of the trip: A visit to Daimler-Benz in Germany. They arrived in the United States on Feb. 10, 1972, unprepared for winter. They struggled through blizzard conditions and weren't equipped with heavy coats and boots until a stranger insisted on outfitting them. They rode through Canada (!) and, eventually 27 U.S. states and Mexico. 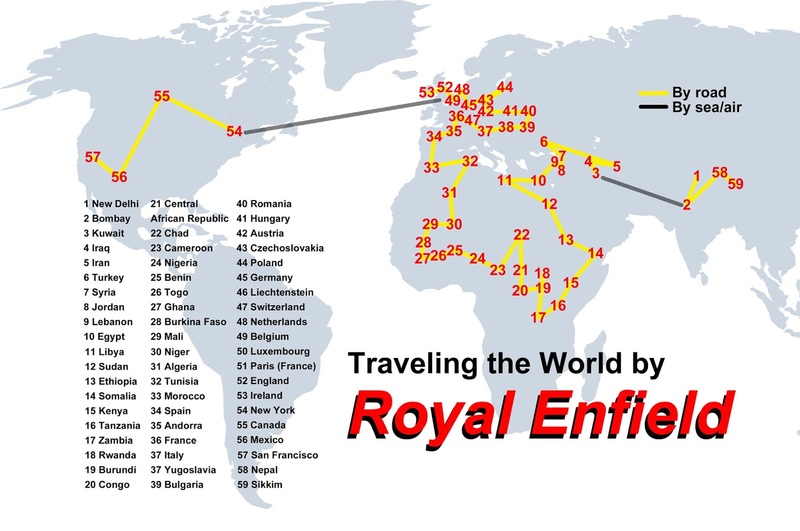 They had thought to travel across the Pacific and thus to India, but wars were again in the way, and the Royal Enfields were worn down. The bikes would be shipped from San Francisco to Bombay, but the two riders still had to get home. Which they did, by hitchhiking from San Francisco to New York and then hitchhiking from France to Afghanistan. Arriving by train in Bombay they found it would not be easy to get their own Indian-made motorcycles re-admitted to India by customs. 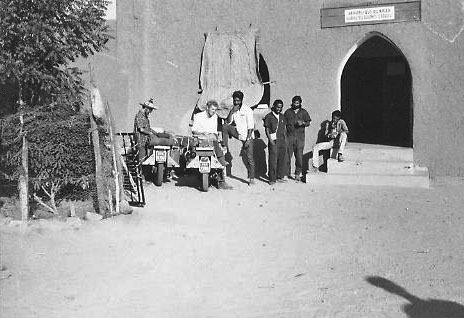 Eventually they were able to ride to their original starting point, arriving on July 10, 1972. "When we were back in India on the same motorcycles we traveled to Nepal and Sikkim," Subhash Sharma told me. Subhash Sharma's account ends with this: "Eighteen months, 108,000 kilometers, 52 countries... countless memories." It was an epic journey that did not circle the world, but could have. The circumference of the Earth, at the equator, is just over 40,000 kilometers. Part 1: The Story Behind the Story. Part 3: Riding Through the United States. Winter 1971-72 was horrible, especially in the Midwest. When it finally broke in March, we rejoiced. I'm glad I wasn't riding a motorcycle in that. No, I am nothing to do with Hitchcocks - just a very satisfied customer.